Google Cloud Search allows employees of a company to search and retrieve information, such as internal documents, database fields, and CRM data, from the company's internal data repositories. Warning: You must sign up for a Google Cloud Search account before you can use the APIs and SDKs. To sign up, visit the Cloud Search product page. Software used by an enterprise to store its data, such as database used to store employee information. Data from a repository that has been indexed and stored in Google Cloud Search. The user interface used by employees to search a data source. A search interface can be developed for use on any device, from a mobile phone to a desktop computer. The Google-provided search widget can also be deployed to enable search within your internal web sites. The search application ID is included with every search to ensure that the context of that search, such as within a customer service tool, is known. The site cloudsearch.google.com contains a search interface. A group of settings that, when associated with a search interface, provide contextual information about searches. Contextual information includes the data sources and search rankings that should be used for a search using that interface. Search applications also include mechanisms for filtering results and enable reporting on data sources, such as number of queries made over a given time period. A data structure outlining how the data in a enterprise’s repository should be represented for Google Cloud Search. A schema defines the employee Google Cloud Search experience, such as how things are filtered and displayed. A software program used to traverse the data in an enterprise's repository and populate a data source. 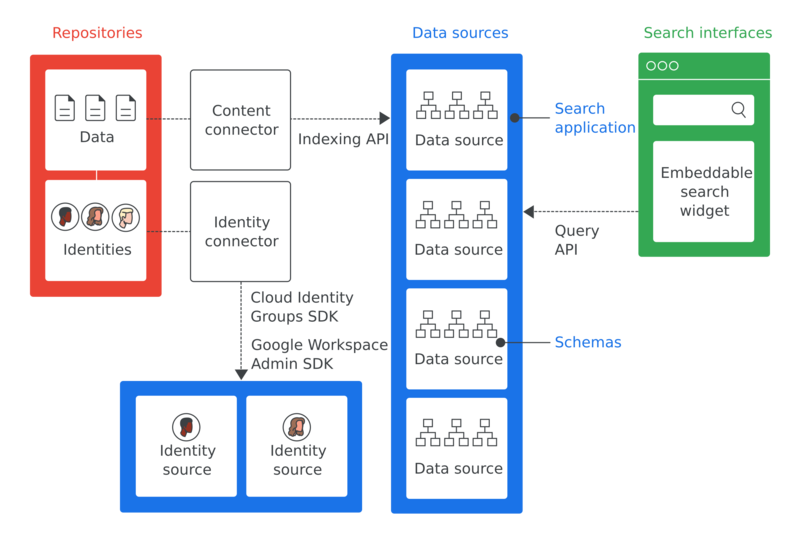 A software program used to sync enterprise identities (users and groups) to the identities required by Google Cloud Search. Employees need a way to find corporate policies, documents, and content authored by other employees. Customer service team members need to find relevant troubleshooting documents to send to customers. Employees need to find internal information about company projects. A sales representative wants to view the status of all support issues for a particular customer. Employees want a definition for a company-specific term. The first step in implementing Google Cloud Search is to identify the use cases solved by Google Cloud Search. By default, Google Cloud Search indexes G Suite data, such as Google documents and spreadsheets. You do not need to implement Google Cloud search for G Suite data. However, you need to implement Google Cloud Search for non-G Suite data, such as data stored in a third-party database, file systems like Windows Fileshare, OneDrive or intranet portals like Sharepoint. The following steps are required to implement Google Cloud Search for your enterprise. Determine a use case that Google Cloud Search helps to solve. Identify the repositories holding data relevant to the use case. Identify the identity systems used by your company to manage access to data in each repository. Configure access to the Google Cloud Search REST API. Add a data source to Google Cloud Search. Create and register a schema for each data source. Determine if there is a content connector available for your repository. For a list of pre-built connectors, refer to the Cloud Search connector directory. If a content connector is available, skip to step 9. Create a content connector to access data in each repository and index it into a Cloud Search data source. Determine if you need an identity connector. If you don't need an identity connector, skip to step 11. Create an identity connector to map your repository or enterprise identities to Google identities. Create a search interface to perform search queries. Try the Google Cloud Search getting started tutorial. Determine use case(s) for which you'll use Google Cloud Search. Identify the repositories relevant to these use cases. Identify any identity systems used by your repositories. Continue to Configure access to the Google Cloud Search API.